According to Golf DataTech, 94% of serious golfers believe that having the exact distance to hand is essential to their game and with every course in it's 30,000 pre-loaded range walked and mapped out manually, SkyCaddie has the most accurate GPS systems on the market. Over SkyCaddie's 12 year life, they have set out to answer the question "How Far?". How far to the bunker, water, center of the green? Whatever your skill or handicap, having reliable distance information is key to the perfect game. To try and answer this question, fully trained TrueGround mappers are sent to every course with highly accurate GPS survey equipment.Using this method, they can eliminate known errors that other GPS RangeFinders still contain. SkyCaddie have a range of products with these accurate maps to match any golfer with any ability. In addition, the first independent study of the DMD market revealed that more golfers use SkyCaddie devices in their game than any other GPS RangeFinder. 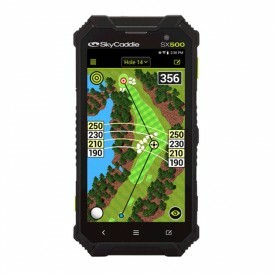 Skycaddie Skytrack launch monitor is the latest from Skycaddie and competes with launch monitors such as Foreseight GC2.